It wasn’t until the 1970s that visitors could take Highway 19 to easily access Vancouver Island’s northern region. Until then, calling on such villages as Port McNeill, Telegraph Cove, Port Alice and Port Hardy was by the marine highway—just like the Namgis and the Kwakwaka’wakw who have lived, fished and hunted in this area for the last 9,000 years. 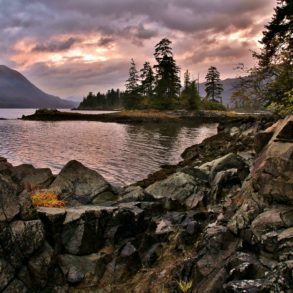 Telegraph Cove is built around a tiny harbour on Johnstone Strait, about 26 kilometres southeast of Port McNeill, across from Hanson Island and near Robson Bight, famous for its orca-rubbing beaches. 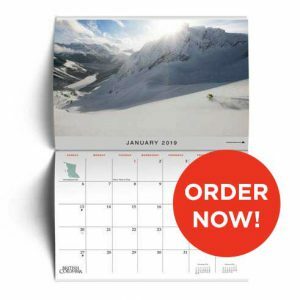 The hamlet’s winter inhabitants fluctuate between 10 and 15, but during its summer season, beginning mid-May and ending early October, up to 120,000 people holiday here. A kayaker returns to Telegraph Cove after a day on the waters of Johnstone Strait. 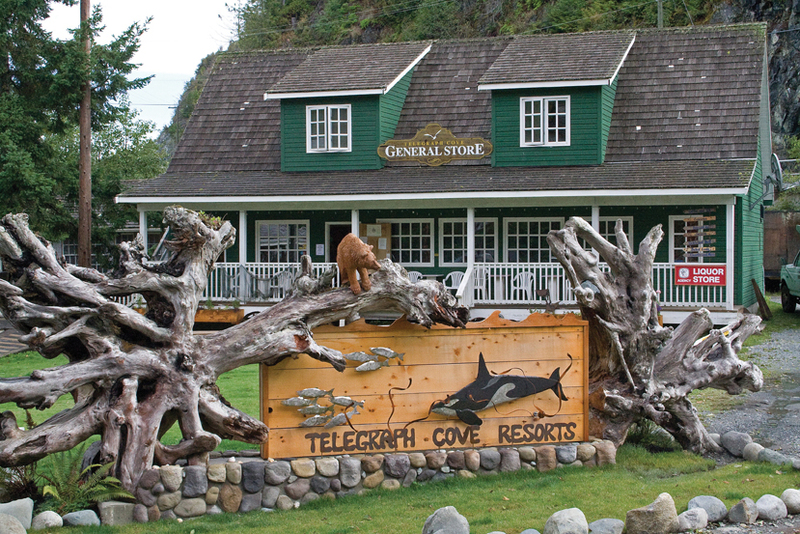 Telegraph Cove gained its name in 1911, when the Superintendent of Telegraphs was looking for a location from which to expand the telegraph network north from Campbell River. He chose this small indent and named the site after the transmission device of the day—then as important to communications as the internet is today. 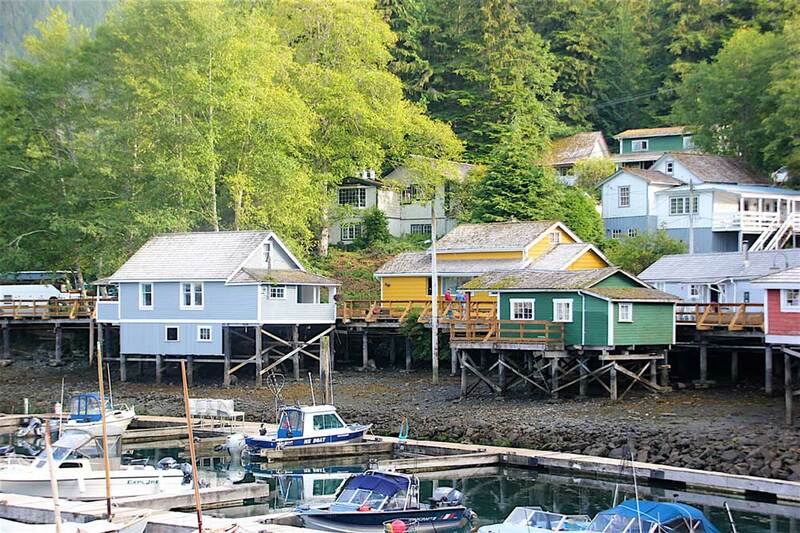 Today, Telegraph Cove has mingled its industrial heritage with lodging, modern eateries, coffee shops and eco-tourism. Around the harbour, pilings support housing, restaurants and a broad boardwalk. The bottle-green waters often shelter octopuses measuring up to three metres and other marine creatures. A good part of the village belongs to Gordon and Marilyn Graham, who moved here permanently 39 years ago. Over the years, the Grahams acquired most of the Cove’s buildings, maintaining and expanding them. The new cottages, revamped historic homes and condos offer accommodation. A kilometre up the hill, a fully serviced campground has more than 100 sites for campers and recreational vehicles. Gordie owns the general store with its outdoor seating surrounded by planters full of cheerful nasturtiums. Two restaurants, the marina and most of the buildings along the boardwalk are also part of the resort. He continues to repair and embellish, ensuring the cove’s history remains a strong part of its attraction. A new 24-room lodge, built to resemble the Whale Interpretive Centre, will open this summer. When we visited, the marina was in full gear. A flock of guided sportfishers zoomed out daily to catch their quotas of salmon, halibut and rockfish. A few pleasure craft occupied the visitors’ dock. Stubbs Island’s two whale-watching vessels took travellers to see orcas and other marine mammals. 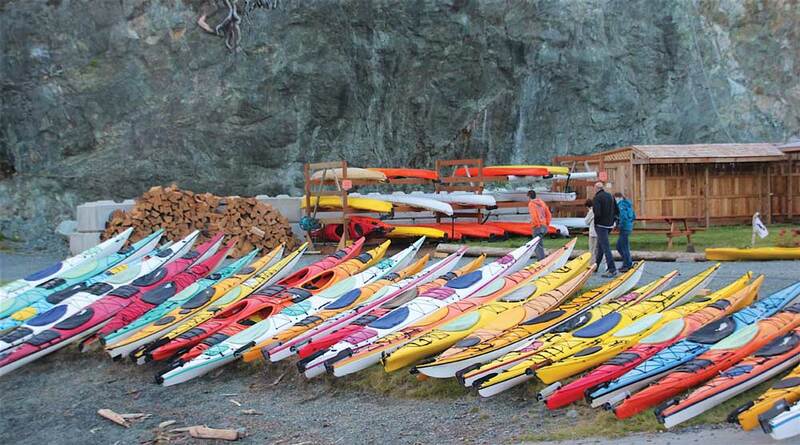 Across the harbour, North Island Kayak’s brilliantly coloured kayaks lined the shore attracting droves of paddlers. In 1980, Jim Borrowman founded Stubbs Island Whale Watching—the first in BC to offer boat tours with whales as the primary focus. Jim had moved to Telegraph Cove in the mid-’70s to ply his underwater photography trade. When he saw his first orca, it “struck me like a lightning bolt,” he said. “I could never go back to the city.” He began studying marine biology, bought his wooden Gikumi and began the whale-watching venture. It took some time to take off, but as interest in the natural environment grew, so did the clientele. 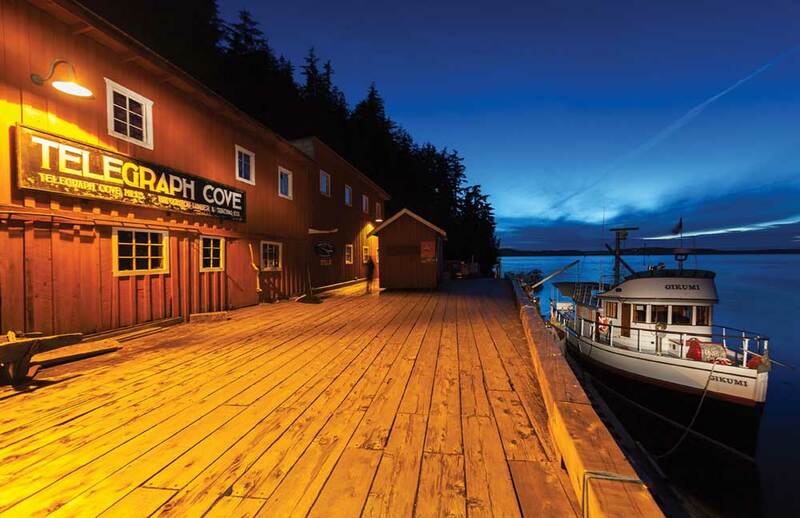 The Historic Whale Museum building and the original whale watching boat, the Gikumi at Telegraph Cove add to the appeal of this popular tourist destination. 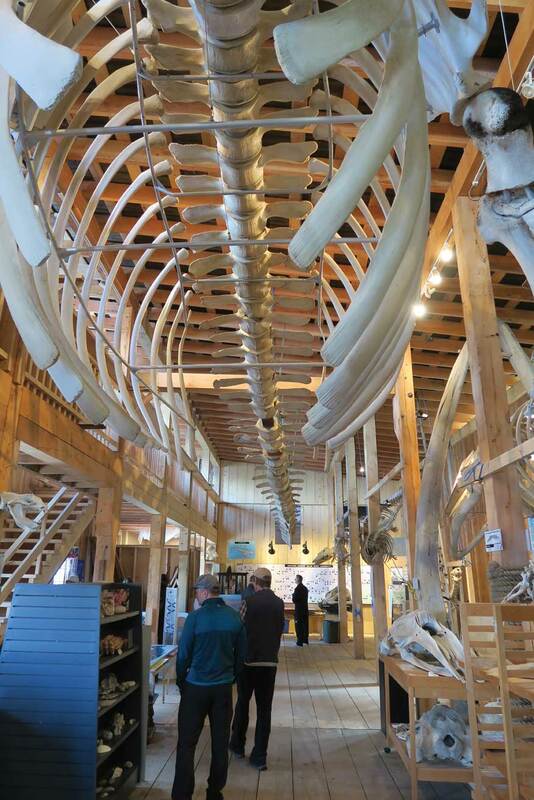 The centre has hung a 60-foot fin whale skeleton from the ceiling. A sperm whale’s pointy skull with its huge, sharp teeth—each one can weigh a kilogram—is another impressive sight. Other skeletons include a black-tailed deer, a bear, a cougar, a sea lion, dolphin and otter. The centre offers a “kid’s corner” and conducts educational programs for children. The company offers a guest-to-guide ratio of six-to-one. Guides carry hydrophones so everyone can hear the orcas communicate. Kayaks are accessible for people ranging from ages five to 90. “Paddlers get excited when they see a six-foot dorsal fin swimming in their direction,” says Steve. “It’s a bit prehistoric, like Jurassic Park! Telegraph Cove perfectly blends the history of a resource community with the contemporary interests in our natural environment. It offers adventures, yes—but with modern conveniences, like great dining and interesting culture. 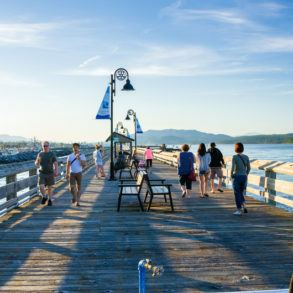 A wealth of information on visiting Vancouver Island North can be found at getlostfindyourself.ca. Tide Rip Grizzly Bear Tours passengers ride a water taxi to Glendale Cove, off Knight Inlet. There they board herring skiffs, whose flat bottoms permit moving up the river where grizzlies feed. 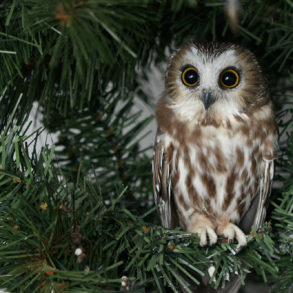 The tours have a 95 percent sighting success rate over the years. 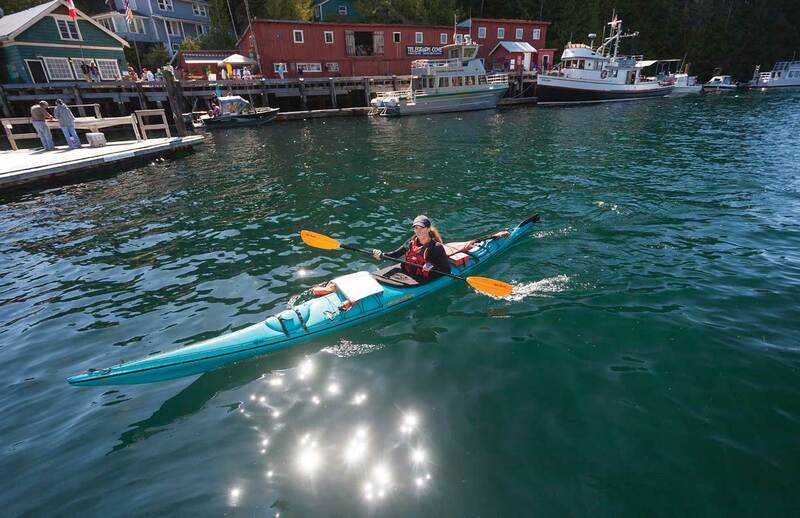 North Island Kayak organizes a broad selection of guided kayaking tours ranging from two-hour family excursions into Johnstone Strait to eight-day all inclusive kayaking/camping trips visiting several islands, including the famous Robson Bight where orcas often congregate. 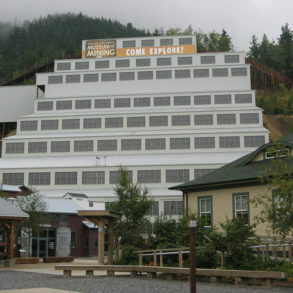 The company is housed in Telegraph Cove but also conducts tours from Port Hardy. Stubbs Island Whale Watching offers its wildlife tours on two aluminum vessels, the Lukwa and the Kuluta. Visitors delight in viewing minke and humpback whales, harbour and Dall’s porpoises, bears, Steller sealions, many birds, Pacific white-sided dolphins and of course, orcas. An extensive network of trails on the North Island, Malcolm Island and Cormorant Island is displayed at getlostfindyourself.ca/trail-app-recreation-map. It includes distances, level of difficulty, seasonality and a short description. The trail to Blinkhorn Light begins in Telegraph Cove and is named after its builder, Dave Farrant.